With the dual benefit of wireless transmission and 3G capability, the Samsung Galaxy Camera will perhaps one day be viewed as the camera that ventured first in a direction all others are likely to follow. 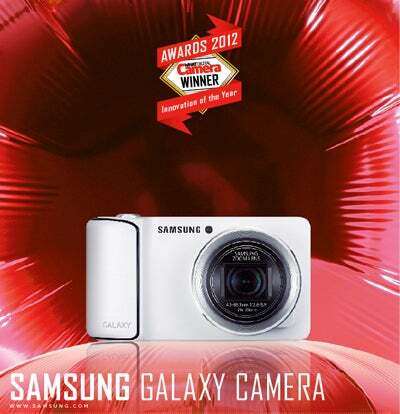 That’s not to say the Galaxy Camera is only about its connectivity though, as there’s plenty more to intrigue and impress. Top of the list is a lens with a 35mm-equivalent focal range of 23-483mm, although the High Definition touchscreen display that dominates the rear of the camera is arguably just as great a highlight. Running Android’s Jelly Bean OS, the camera can be augmented with a range of apps from the App Market, although with a plethora of editing functions, scene modes and even slow-motion video capabilities as standard, it proves its mettle even without these. And, of course, to ensure you never accidentally delete your images, you can back up to the cloud as you shoot.